I picked up the racket for the first time in 20 years, I am doing newly and enjoying it. I used Mark V 20 years ago. 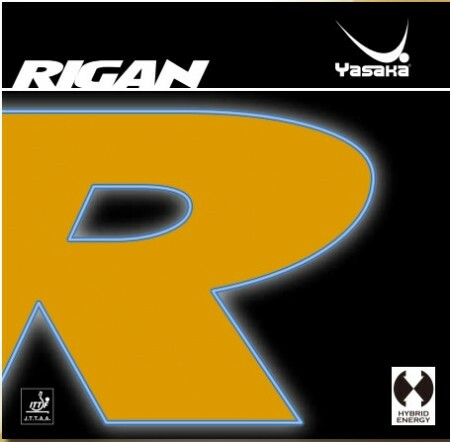 I was looking for a rubber with high control performance, I got lost with Katelsoft or Rigan and made it the latter. I will fly to where I want to beat the speed to come out. It feels good. I used to think about going back to the basics and origin when I was lost in play and rubber recently and I was searching for various things. I was back with a batch! After all it is easy to use stable rubber is the first thing! Touch up	（Experience：More than ２０ years）	Yasaka makes good rubber. . . It is easy to use as rumor! It can be used more than usual in any technology. Sufficient speed and rotation are also required. Soft and easy to handle any ball processing. And because the amount of money is cheap, it achieves a wonderful cospa. Yasaka has been developing good rubber since ancient times. Marriott	（Experience：６〜１０ years）	Close to Tenagi 64 FX! It is in the position of the rubber for the back, but it is good enough even with the fore. Soft minutes, image is close to Tenaji 64 FX! I put a hard and heavy rubber on the fore side, so I attached it to the back side with a light, rotating rubber. Anyway, it is easy to hit the chikita and back drive because it is easy to catch and the ball feels to fly upward, and the block is also easy to do because the sponge is soft. In addition, high-quality drive was hit from the stand a little from the stand with the sponge and the top sheet with the Kosi. However, because there was a little bit of difficulty because the rubber was soft, the place was covered with practice. This rubber is recommended on both sides of beginners and on the back side of intermediates. It seems like a step up rubber for beginners and so on from the price etc, but personally there is a sense of stability than Vega Asia DF, but is it still the speed at the time of banging or not? I think. In the back, I think that it can be used without any problem even in advanced intermediate-level people who are not power-oriented. Because the arc line is high, the block you hit is lifted, but because the arc line is high, it enters stably from the lower position from the middle position, so I find it difficult to have footwork. I think that it is the best for the back of the pen because the weight is also light. The double is reverse, so it's heavy to put both sides behind, so it's a light and stable feeling, and the speed of the smash is a certain level and the liggan was perfect. Please use it on the back of the pen if you do not emphasize power! It became a reigan and the back strike has improved! As it is a rubber that simply lifts up, you can improve your back strike even if you are not good at it.